If you are filing for separation from your spouse in Wisconsin and minor children are involved, you may represent yourself. This article discusses the petition you can file against your spouse to initiate a divorce or legal separation. This document is available on the Wisconsin Court System website. Wisconsin Petition With Minor Children FA-4108 Step 1: Enter the name of county where you are filing your petition. Enter your name and address in the section for the petitioner, and that of your spouse in the section reserved for the respondent. Indicate whether you are pursuing a divorce or legal separation. Wisconsin Petition With Minor Children FA-4108 Step 2: In section A, provide all information requested about your residency status and birth date. 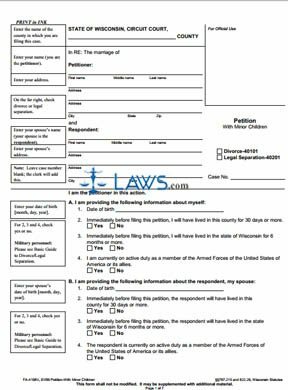 Enter the same information concerning your spouse in section B.
Wisconsin Petition With Minor Children FA-4108 Step 3: In section C, provide the date and location of your marriage. You should also detail both spouses' previous marriages and any previous legal actions regarding your marriage which were filed in Wisconsin. Wisconsin Petition With Minor Children FA-4108 Step 4: In section D, detail all minor children involved in the marriage, including adult non-dependant children and those had by the mother by someone other than the husband. Note any related court orders. Provide the address and name of all places the children lived in the last five years. Wisconsin Petition With Minor Children FA-4108 Step 5: If a child support payment order or agreement is already in effect, attach a copy. Wisconsin Petition With Minor Children FA-4108 Step 6: Under the section headed "I ask that the court," indicate with a check mark in the second line whether you are requesting a court order regarding alimony or other support payments. Wisconsin Petition With Minor Children FA-4108 Step 7: Sign and date the fifth page in the presence of a notary public.